This post, the fifth in a series, explains the "English Learners" indicator on the California School Dashboard. The Dashboard, which made its debut in March of 2017, provides significant information about the academic "performance" of students learning English. If you don't understand the basics about the Dashboard — especially how it blends "status" and "change" — you might want to read this blog series from the start. What does it mean to be an English Learner? Over 40% of California's students speak a language other than English at home. About a fifth of California's students are categorized as "English Learners," which means that they aren't fully fluent in English yet. As described in Lesson 6.3, an important role of California's school system is to ensure that each student progresses to fluency in English regardless of their starting point. California's school finance system provides funds to school districts and charter schools specifically with this educational need in mind. For now, the ELPAC is still in transition, and the dashboard only summarizes results in broad terms. English fluency "status" scores are grouped into four stages of proficiency, listed in the image to the right. At the time that multiple years of ELPAC results become available, the dashboard will begin calculating a change measure that evaluates school and district progress in support of students learning English. Is my school good at teaching English Learners? You cannot tell whether a school is good at teaching English Learners just by averaging ELPAC scores (or levels of proficiency) in a single year. The mix of students in any school can change significantly from year to year based on immigration patterns, economic factors or sheer chance. The definition of a great school for English Learners (ELs) is one that quickly advances the English language skills of each individual student from one year to the next, regardless of where they begin. Individually matched data like this (known as "longitudinal" data) is essential to interpreting patterns of success. 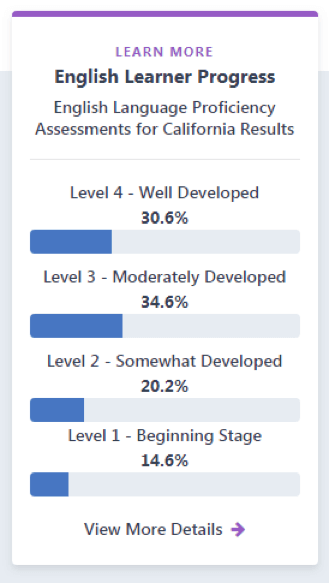 Even when longitudinal test score data becomes available, it will take some time for California to develop meaningful performance measures for the English Learner Dashboard; in 2019 the State Board expects to define threshold scores, a necessary early step in the process. At this point you might be wondering how your school measures up when it comes to educating English Learners. When you visit the Dashboard and look up your school you won't get a clear answer. The Dashboard for English Learners is a work in progress, and it may take awhile for the State Board to get it figured out. The root cause of this delay is the state's decision to change from an old test (CELDT) to a new one (ELPAC). In a few years this transition will be forgotten, and we will edit this paragraph out of this post. In the meantime, the transition is actually a great example of the practical challenges of change. Updated January 2019 with significant feedback from Mary Perry. When I look on the dashboard, I see a Fall 2017 release and a Spring 2017 release. What is the difference? Which year of testing do they each cover? My understanding is that the students only test once a year, so it makes sense that there would be one release per year. When released each year, the Dashboard shows the PRIOR year's data as "status" and it compares to the PREVIOUS PRIOR year to determine "change" metrics. The release data of the dashboard can be a bit fluid. The Department of Education is stuck between competing mandates: time and quality. They want to get it out, but they also want to get it right.